New 3 MHz Function - Pulse Generators, Scientech 4061 & Scientech 4062 with 20 x 4 character LCD, fullfil today's demand of electronics laboratories in universities, colleges and training centres.They have all ! whether you need Pulse and Ramp in addition to Sine,Square, Triangle over the frequency range of 3/10 MHz, or you need internal and external AM-FM or internal sweep, or PWM. The series have all and also TTL Output.It has separate operations for function, frequency, modulation, attenuation and Frequency Counter.Pulse duty cycle and sweep time are variable. AM standard and AM balanced modulation are done with great accuracies showing clearly the depth of modulation. Attractive sleek design makes this new series an ideal choice for modern laboratories. Users can choose from 12 different standard waveforms. Arbitrary waveforms can be generated up to 128 K in length at high sampling rates. On pulse waveforms, leading and trailing edge time can be set independently. External signals can be connected and added to the output signal. Dual-channel models can generate two identical or completely different signals. All instruments feature a highly stable time base with only±1 ppm drift per year. Color TFT LCD screen on all models shows all relevant wave form parameters and graphical wave shape at a single glance. This gives full confidence in the signal settings and lets you focus on the task at hand.Shortcut keys provide direct access to frequently used functions and parameters. Others can be selected conveniently through clearly structured menus. This reduces the time needed for learning and relearning how to use the instrument. Look and feel are identical to the world's most popular TDS3000 Oscilloscopes. With this PC software waveforms can be seamlessly imported from any Tektronix oscilloscope, or defined by standard functions, equation editor,and waveform math. Low Distortion SFG-1000 Series, an economic function generator with high accuracy and high stability output, is designed based on the DDS (Direct Digital Synthesis) technology embedded in a large scale FPGA. 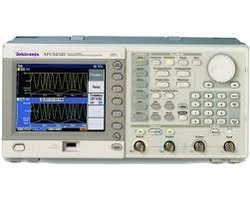 The frequency range of 3 MHz and the output waveform selection as Sine, Square, Triangle and TTL of SFG-1000 Series adequately provide the fundamental features to ensure high confidence for the test results. The DDS technology at an affordable price gives a high-value solution to the users who need a signal source for accurate but unsophisticated measurement applications. The frequency drift and the amplitude instability of conventional signal source sare fatal uncertainties to the high-accuracy measurements. employs PLL(Phase-Locked Loop) circuitry to generate a stable waveform at 20 ppm accuracy & stability covering the frequency range from 0.1Hz up to 3MHz. When is utilized to conduct experiments in the laboratory, it secures the signal sourcere liability, which is beyond the reach of any traditional signal generators. To most of the test engineers, it is always an annoyance trying to get rid of the ringing coming from the signal source being usedto stimulate the DUT. The high precision measurements need to employ a signal source without the existence of harmonic components, which adhere to the oscillator of conventional signal generator circuit. 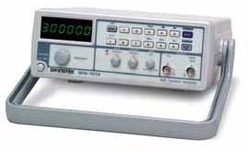 SFG-1000 Series, built over a DDS platform,generates the waveform through high performance DAC and high-speed comparator to effectively avoid the generation of harmonic components.Utilizing direct digital synthesis technology,SFG-1000 Series provides an output waveform with 55 dBc low distortion ranging from 2m Vpp to 10 Vpp output level. At the pressof a button, you get a stable and high purity output signal from SFG-1000 Series right away. The thoughtful human interface of SFG-1000 Series gives users a friendly operation environment. There is no need to go through a long and tedious learning curve to get used to the operations of the product. Thekey operation functions and the output on/off control are the advanced features that could only be seen on the high-end devices. You could enjoy all these conveniences at a very affordable cost. A signal output with selectable waveform among Sine, Square and Triangle, and an additional signal output at TTL level are included in SFG-1000 Series. The output control features include frequency adjustment, /-5V DC offset and 40 dB attenuation. All the fundamental features of a signal generator are well equipped on SFG-1000 Series with high accuracy and stability. Combining convenience,accuracy and economic cost, SFG-1000 Series3 represents the beauty of GW Instek's design. Built - in crystal time base multi range DIGITAL TIMER. True RMS digital metering of outputs. Compact rugged design - Fully tropicalised.Auto-switch off in all modes of operation. All current outputs fully isolated and distortion free. Suitable for testing thermal devices All controls and metering centralized. Almost all electricity supply protective equipment is fed from a current transformer on the supply cable or busbar. Primary current injection testing checks all the components of the protective system. A high test current, enough to cause the protection equipment to operate, is injected into the supply cable. Time takenfor the protection relay to operate is then measured. Udey PCT is essential when commissioning new protection systems and after major repair and component replacement, since it tests the whole system. Maintenance and routine testing of protective devices and systems by means of primary current injection,timing tests on protective relays- both magnetic and thermal types, current transformer ratio testing etc. Udey PCT series comprises of two units: 1) a control unit and 2) a loading unit. Thus making the tester compact and portable. Four models are available with outputs from 250 A to 3000 A. The control unit offers a current output of 0-10 Volt at 50 Amp or 0-5 Volt at 100 Amp. Additionally, a separate voltage output of 0-250 V AC is available for testing voltage operated relays coils or checking the magnetization characteristics of current transformers. Current and voltage outputs are varied from the output controller. The output current is supplied through wing nut bolts to the low inductance leadset (available optionally).The voltage output has a separate pair of terminals. Each set has a built-in multi range timer. All current and voltage levels are displayed on digital LED meters. The elapsed time measured by the timer is also displayed on 4 digit LED display. Circuit protection is by circuit breaker in input. Controlled switching ensures that, in the event of power failure or timer cut off operating, the output cannot be re-energized until the controls are reset, thereby offering protection to the equipment and the operator. The mains supply for the tester is 240 volts, plus 10 % minus 6 %. For 110 volt input operation, an input adaptor can be supplied.The control unit houses all necessary controls and metering for the complete equipment. 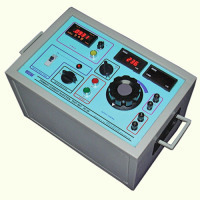 The output voltage and currents are indicated on digital panel instruments. Automatic control has been provided such that the selected output can be switched off once the device under test has operated. The automatic control can be switched in and out of circuit for the selected output, this enables setting up tests to be performed. The control unit is provided with a crystal time base timer for timing relays whose contacts are either normally open or normally closed. The control unit and loading units are housed in robust cases complete with fold away lifting handles. 2. 2 meter long 3 core mains cable..
3. 2 meter long inter-connecting cable. 1. Low inductance lead set. 2. Precision grade (0.5%) Analogue meter with Current transformer. Looking for FUNCTION GENERATORS ?